Trim excess fat off roast. In a small bowl, combine brown sugar and ginger; rub generously over roast. Remove pork to large bowl and shred with forks. Strain pork liquid from slow cooker and pour over pulled pork to moisten. Squeeze lime juice on top and mix well. For each serving, cover corn tortilla with 2 tablespoons cheese; microwave for 20 seconds. 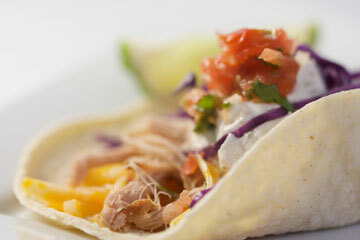 Top with pulled pork, 2 teaspoons of sour cream mix, 1½ tablespoons shredded cabbage and 1 tablespoon of salsa. Fold and serve immediately.